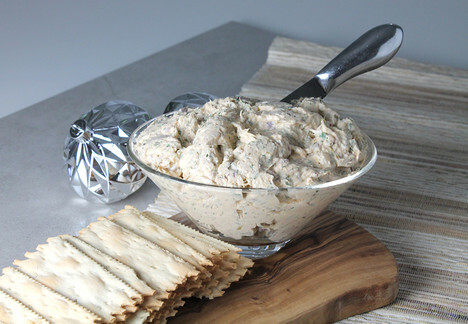 Smoked ahi tuna cream cheese dip served with crackers. In a resealable bag, combine the soy sauce and tuna. Refrigerate overnight. Line a wok with foil long enough to allow a 3-inch over hang. Place the smoking chips and 2 teaspoons thyme on the bottom of the pot. Top with a footed wire rack. Place the tuna on top of the wire rack. Discard soy sauce. Cover with a lid and crimp the foil over the lid leaving a 1/2-inch vent. Heat the wok over medium-high heat until smoke seeps through the vent. Reduce the heat, cook for 40 minutes. Remove the fillets and allow to cool. Add the heavy cream, mix until light and fluffy. Add the remaining 1 teaspoon thyme, mayonnaise, hot sauce, onion, lemon zest, lemon juice, parsley, salt and pepper. Mix until combined. With a fork, flake the tuna and stir into the cream cheese.